Melvin Calvin showed how to use the radioactive isotope carbon-14 as a tracer to study complex organic chemical systems, detailing the path of carbon in photosynthesis, laying out the what is now called the Calvin cycle of carbon movements through a plant. In his experiments, plant cells were allowed to absorb carbon dioxide that had been marked with the radioisotope carbon-14, then immersed in boiling alcohol, allowing the synthesized compounds to be identified. His work, first published in 1950, changed the scientific understanding of photosynthesis, establishing that sunlight causes a reaction in a plant's chlorophyll (not in its carbon dioxide as was previously believed) to manufacture organic compounds. 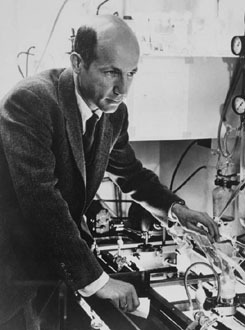 He won the Nobel Prize for Chemistry in 1961, and also conducted respected research into brain chemistry, chemical carcinogenesis, the chemical evolution of life, the feasibility of using oil-producing plants as a renewable source of energy, moon rock analysis, organic geochemistry, radiation chemistry, and the role of chlorophyll in quantum conversion. His parents were Russian immigrants who ran a neighborhood grocery store in Detroit, and Calvin said he first became intrigued with chemistry by wondering at the chemical make-up of the soaps and breads on the shop's shelves. His college education was delayed by the Great Depression, during which he dropped out of college and worked for several years at a brass factory in Detroit.